Join the discussion on our forums! Come discuss Dozing Marksman over in our dedicated Dozing Marksman discussion topic. Has +4 Attack while damaged. It's the sleeper of the set. Seems that this card and Quartz Elemental is the reason why Enrage is gone as a keyword. There's no reason why an elemental becomes a pacifist when angry, and Dozing Marksman's flavor is that he's an able gunner but is asleep, needing some kind of alarm to wake up. Enrage got removed because it's too hard to came up with a flavor that fits the mechanic in a different direction. Might see some play with Overlord's Whip. 4/3 for 2-mana is great. Isn't Overlord's Whip just worse than Blood Razor at all times? Depends on deck. Blood Razor is rotating soon, btw. so at best a 2-mana 4/3? pass. Is it bad that I wish this guy had a different portrait for whenever he's "awake"? Just a big wide-eyed version looking up from otherwise the same pose. The sleeper of the set. 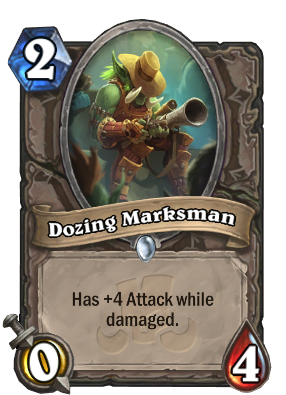 Dozing Marksman looks like a worse version of Redband Wasp, which already sees little to no play in a class that's well suited to activating the enrage effect. Can't imagine this will be stronger. I feel like he will be sleeping until he will fill all the packs. He always wakes up angry. Enraged, even.